Fall is the perfect time to immerse yourself in Denver’s thriving cultural scene. There&apos;s something for everyone. Denver is devoted to reflecting the many communities and cultures that make up The Mile High City. We hope you&apos;ll join in the celebration! Sept. 16, 2018-Jan. 6, 2019 | Denver Art Museum will be the sole venue for this exhibition, which will showcase more than 100 prints, drawings, and paintings. Sept. 29, 2018-Jan. 13, 2019 | Experience immersive simulations, iconic historical touchstones and inspiring stories from game-changing innovators. Oct. 26, 2018-Jan. 20, 2019 | Discover the dynamic culture and abundant biodiversity of the Caribbean’s largest island nation in the new exhibition ¡CUBA! Nov. 3 | Denver's best museums stay open late and admission is free between 5 and 10 p.m.
Thru March 17 | This stunning exhibition surveys 70 years of the House of Dior's enduring legacy and its global influence. Celebrate the city's arts and culture scene, Nov. 2-10, with hundreds of events around the city. Friday & Saturday evenings in October | Take an immersive night walk down an eerie trail, plus jack-o’-lantern sculptures, seasonal food and drinks, animal meet-and-greets, and more. Oct. 5-14 | The Colorado Ballet takes you to an enchanted world, choreographed by Marius Petipa with music by Peter Ilich Tchaikovsky, performed live by the Colorado Ballet Orchestra. Oct. 31-Nov. 11 | Denver's premier cultural event of the fall, featuring more than 250 blockbusters, docs, shorts and indie films. Find the pulse of Denver's vibrant creative community year-round on the first Friday of each month. 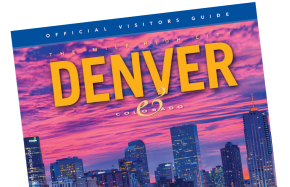 Explore Denver's creative neighborhoods! See 150 haute couture dresses from House of Dior's enduring legacy. Now through March 17. Sept. 7-Oct. 14 | With a spring in their step and a song in their hearts, cowboys, farmers and traveling salesmen alike chase their destinies to a land that promises everything. Sept. 25-Oct. 13 | One of the most celebrated musicals of the current Broadway season will launch its first national touring production in Denver. Oct. 23-28 | The ultimate love story continues in "Love Never Dies," Andrew Lloyd Webber’s spellbinding sequel to "The Phantom of the Opera." Nov. 3-4 | Join the world's biggest festival of hip-hop dance theater. Nov. 13-25 | Broadway takes you into the heart of the remarkable true story of 7,000 stranded passengers and the small town in Newfoundland that welcomed them.